The Super Sand Eagles on Monday crashed out at the group stages of the Bahamas 2017. 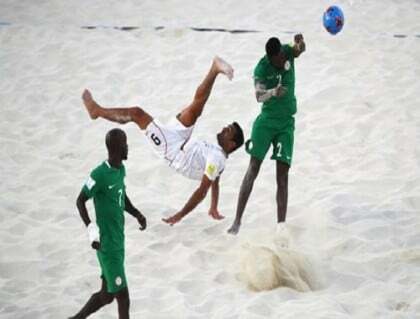 The team failed to progress to the quarterfinals of the FIFA Beach Soccer World Cup in the Bahamas after losing 1-2 on penalties to Iran following a 4-4 draw after three periods. Nigeria head coach Audu Adamu opted to stick with same five players who started in the previous game against Mexico in which they needed a last gasp Abu Azeez to win 5-4. Moslem Mesigar went in straight from the start for the Iranians. Iran showed why they are Asian champions and also ranked number five in beach soccer in the World when Nigeria stopper Danjuma Paul went down quick to stop Mohammad Ahmadzadeh’s shot just three seconds into the match. Six minutes the Iranian forward Mohammad Mokhtari’s effort came off the crossbar while Ikechukwu Ibenegbu’s shot for Nigeria was saved by Peyman Hosseini. Iran captain Ahmadzadeh put his team in the lead with an overhead kick with just over four minutes to the end of the first period. Attempts by Victor Tale and Ogodo could not draw Nigeria level before the first period finished. Three minutes into the second period, it was Tale who evened the score for Nigeria with a fierce shot but the Sand Eagles celebration lasted less than a minute as Mokhtari’s brilliant overhead kick restored Iran’s slim lead. Abu Azeez who had a quiet game then peeled off his marker and his shot on the turn was blocked by Hosseini. With less than six minutes to end the second period, Abu turned provider with a ball over the top which Emmanuel Ohwoferia side footed against the post and then made no error in tapping in the ball into unguarded net with Hosseini well-beaten to level the score at 2-2. Again, Iran went in front. Ahmadzadeh spinned away from Tale and drove the ball left footed beyond Paul to put the Asians in the lead for the third time in the game. The Sand Eagles refused to roll over and Godspower Igudia’s pile driver levelled matters at 3-3 with less than three minutes to the end of the second period. There was time for Iran’s second goalkeeper Hamid Behzadpour to watch his effort crash against the upright. The two teams approached the third period with utmost caution until Ikechukwu Ibenegbu smashed in Ogodo’s pass to give Nigeria the lead for the first time in the match. Two minutes to the end of the third period, Mokhtari’s acrobatic finish put Iran back in the contest at 4-4 and stretched the match into extra time. The extra time produced no goals as it went into spot kicks. Ali Nazem and Amir Akbari scored their spot kicks for Iran while Ibenegbu was the only Nigerian who converted his penalty with Victor Tale and Ogodo missing theirs as the Asians progress to the quarterfinals. Nigeria finished third in Group B behind Italy and Iran.